9 January 2010: A Happy 101 Award – Just When I Need A Smile!! My friend Gini over at Ginisology has gone and done it again. This time she’s awarded me with the Happy 101 Award. Now how did she know I need to be perked-up? Well, I have been in the dumps lately, and this has really helped to cheer me up. Thanks, Gini. You’re the best! Now I have to list 10 things that make me happy, and pass the award on to 10 other blogs. The first one is easy. 1. My brother, Bernard. It never fails, he can always put a smile on my face. He’s my best friend. 2. Savannah, my dog. She is just the sweetest thing, and soooo pretty. I’m an animal lover, but puppies and dogs top the list. 3. Taking with any of my friends on the phone. 4. Honey Baked Ham…or a Jersey Mike’s club supreme…love em! 5. Memories of my mom. 6. Long car rides to nowhere special. 7. Music, especially oldies on Saturday morning. 8. Thinking about retirement… coming soon. 9. Watching my soap operas (my guilty pleasure), and sipping on a Sprite. 10. A clear blue sky on a sunny spring day. Beautiful!! Now, the not so easy part. Ten blogs to pass the award on to. There are many great blogs out there for sure. There are only 7 here, but they are the ones that I read most often, and can honestly vouch for the consistently excellent content. They all have great post, and keep me coming back for more. Here’s to you ladies!! [ADDENDUM: 13 January 2010. 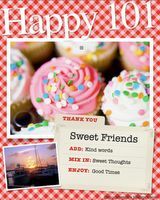 A special thank you to Sharon over at Kindred Footprints, who today gifted me with another Happy 101 Award. It was really nice of you to think of me for this award. I truly appreciate it. Thanks!! Gini, my new genea-friend over at Ginisology, recently gifted me with a Kreativ Blogger Award. What a surprise! As newbie to the world of blogging I am truly touched, and feel honored that Gini thought of me and my blog for this award. I don’t post everyday, or even every week for that matter, so it’s nice to know that when I do someone is enjoying what I write. Gini is really great, and I appreciate this honor. Thank you so much!! The winner of the award has to list seven things about themselves and then pass the award along to seven other bloggers. 1. I grew up as an only child. I was always a little jealous of my friends who had big families with lots of brothers, sisters, aunts and uncles. My family has never had a family reunion and that makes me really sad. Maybe I should take on the task of organizing our first family reunion. I keep thinking if it’s gonna happen, I’ll have to do it. 2. I did not know I had a brother until 2005. Now my brother, Bernard, is my soul mate and my best friend. 3. I love music (oldies..did someone say Motown…The Temptin’ Temptations), books, Food TV, reality shows, and animals. My dog Savannah is my baby girl. 4. My idea of a perfect day would be fishing and relaxing at a lake in the country. Yes fishing!! Yes, in the country. My brother says the “fishing” part comes natural..our daddy did, and our granny and uncle too. We’re still trying to figure out the “country” part because I’m a real city girl. 5. My life has been richly blessed with loyal and wonderful friends. I believe family and friends are two of the most important things in life. 6. I tend to be shy and alooft. People sometimes interpret that as meanness, but I really am a very nice person. 7. Researching my family history takes up most of my spare time. I can’t wait til retirement so that I can spend more time at the Georgia Archives researching. Pass the award along to seven other bloggers. Please visit these blogs often and enjoy the family stories and research that they share with their readers.